The vacuums from the iV4 Emulsio line are the most powerful industrial vacuums and efficient for the collection of chips and liquids from milling machines, lathes, or CNC work centers. Thanks to the powerful dual-stage side-channel turbine and to the spacious collection tank, the vacuums from the iV4 Emulsio line are ideal for combatting the time necessary it takes in order to empty large tanks and the relative reintroduction through an independent electric pump from 400 L / min. With this range of industrial vacuums, iVision has achieved excellent performance levels and a grade of technology with flexibility to satisfy even the most demanding needs of clients in the metal machinery industrial. The novelty of design produced by the vacuums of the iV4 Emulsio line, with their characteristic robustness and flexibility, have become a reference point in the sector of industrial vacuums for metal chips and liquids. The IV4 is the most powerful unit in the Emulsio line. It is able to collect and separate from liquids large quantities of chips from milling machines, lathes and CNC machining centers. Every single vacuum of the iV4 Emulsio series has as its goal to satisfy to the maximum the always-growing demands of clients, looking to create an ideal product and work side by side of machinery that work with heavy metals. a) The vacuum gets switched on by contact without electricity “potential free contact”. b) The vacuum gets switched on with a 24V contact. c) The vacuum gets switched on with a 230V contact. EMULSIO IV2: the compact vacuum cleaner perfect for cleaning mechanical and metal working workshops by iVision. 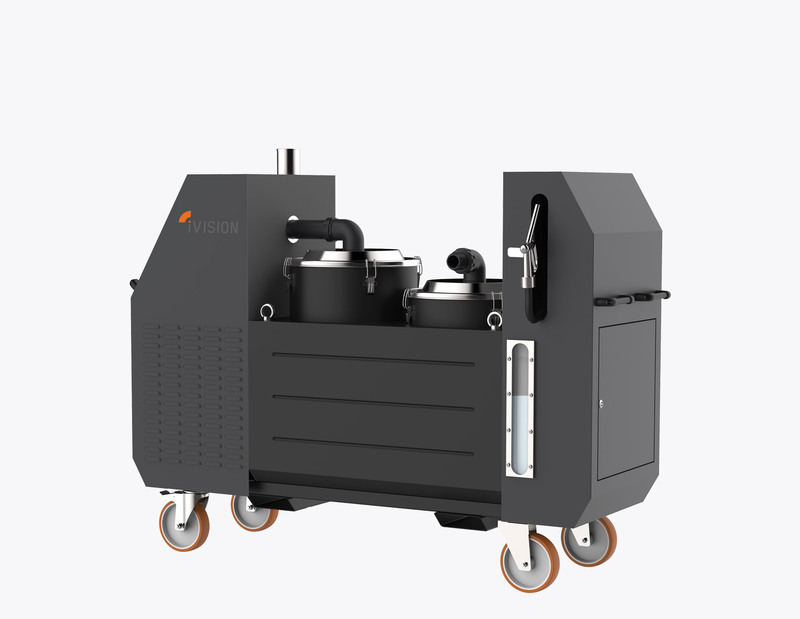 Emulsio iV2 is an efficient and innovative product that arises from the need to separate chips from emulsifying liquids produced by milling machines, lathes and CNC centers.